Verizon iPhone 4 preorders launched last Thursday and at least one guy received his Verizon iPhone. The first iPad-only newspaper, The Daily, launched last Wednesday. I'll review it in an upcoming post. Love is in the air as iOS 4.3 is rumored to be released on February 14th. That will most likely include the subscription model for The Daily and other publications, improved support for AirPlay and bug fixes. 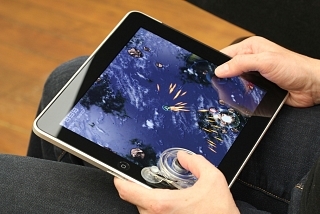 But what really pushed me to write this post is a piece of hardware for the iPad that won Best of Show at MacWorld 2011 - the Fling Game Controller (pictured, above).